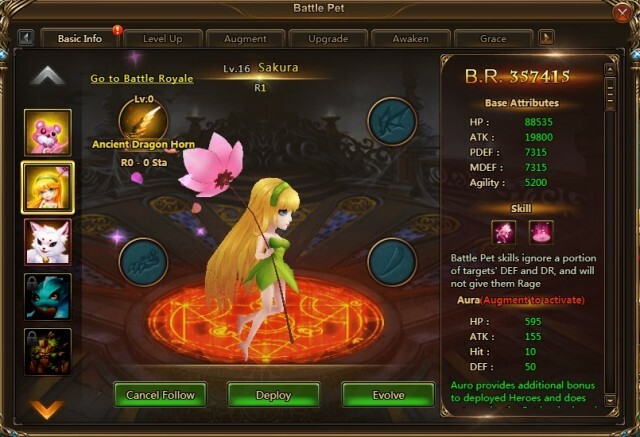 The new battle pet – Sakura, who was born with the cherry blossoms, cannot wait to meet you this blossoming spring! To spread happiness and the fragrance of spring flowers, this delicate and graceful little Fairy left the Garden of the Gods to come to this land. Although Sakura is only half a palm big, the power inside her body is not to be taken lightly. Restores (176%+6570) HP to the entire squad; also grants debuff immunity and increases Crit DMG by 10% until the end of the turn. Restores (226%+8430) HP to the 3 allies with the lowest HP; also grants a shield equal to 30% of the amount healed and increases DEF by 10% for 2 turns. Sakura is ready to assist you in combat! Don’t forget toparticipate in the Single Server Resource Tycoon from Apr 26th to Apr 30th. Collect as many points as you can and she will be yours! Enjoy the Birthday Carnival and all the new contents in LoA II! Last：Angel Athena is Giving Away Special Gifts for the Mother's Day!